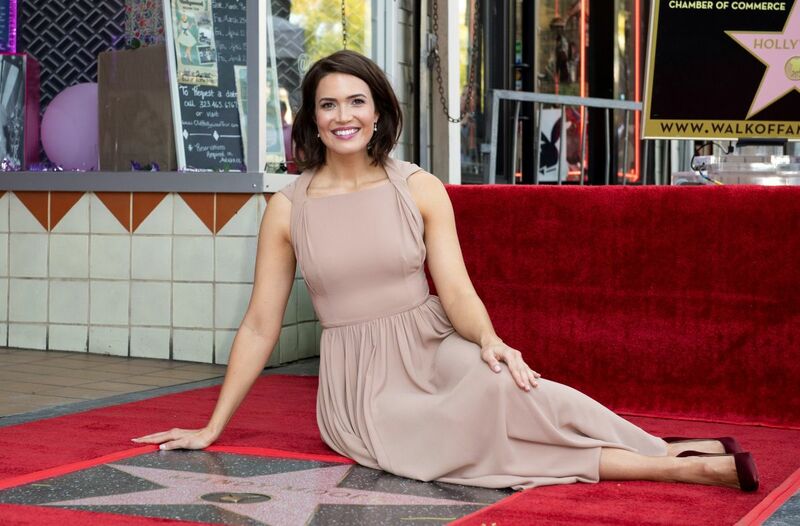 On Monday, Mandy Moore — she of "This is Us," "A Walk to Remember," "The Princess Diaries," all those Garnier commercials and a few really intense episodes of "Grey&apos;s Anatomy" fame — received her star on the Hollywood Walk of Fame. It was a momentous and celebratory occasion, with her beloved co-stars past (Shane West!) and present (literally everyone from "This is Us"!) in attendance. Striking exactly the right balance between "yes, there&apos;s a red carpet here" and "no, this isn&apos;t actually an awards show," Moore and her stylist Cristina Ehrlich chose a breezy mid-length taupe dress by Emilia Wickstead. To make the otherwise minimalist and classic look a little more fun, Moore paired the neutral dress with satin Christian Louboutin pumps in an unexpected burgundy shade. It&apos;s just like the old saying goes: When in doubt, go with a colorful shoe. On the beauty front, Moore kept things appropriately simple, with a berry lip color and glow-y skin that, again, seems to come naturally by virtue of simply being Mandy Moore. This is a very good dress. It's the perfect winter-to-spring transitional piece.